Hi everyone! Today I am back with two cards I created for the Altenew Celebrating Parents Card Drive Blog Hop. I was really happy to join this cause, you can visit the Altenew blog to find out more about it! For today's hop I created two different cards using the Altenew Wallpaper Art and One Day at a Time stamps sets. The florals are colored with the Altenew Tropical Fiesta Markers (you can watch a video where I swatch and use them here). For the first card I created a background by stamping images from the One Day at a Time over an A2 sized card base. For the stamping I used Distress Oxides in Dried Marigold and Milled Lavender. I then stamped the solid black leaves in the Wallpaper Art stamp set directly on the background. The black ink didn't completely cover the pattern I have on the background, but I actually think this adds to the card design. I then glued one of the florals in the Wallpaper art stamp set to the bottom left portion of the card base. I had previously colored it with the Tropical Fiesta Markers by Altenew and die cut it with the Wallpaper Art Coordinating Dies. I didn't have a specific mother or father's day sentiment, so I decided to create thank you cards. I stamped the sentiment (also part of the Wallpaper Art stamp set) on a strip of white cardstock and glued it to the front of my card. For the second card I used again the Wallpaper Art stamps and dies together with the One Day at a Time stamp set. The concept is similar to a card I previously created (you can see it here), but the design is inverted. I started by masking off the center of my card front with some repositionable packaging labels trimmed to 3.75x5". I then stamped the patterns from the One Day at a Time stamp set all around the edges of the card, effectively creating a frame. I used a black liner pen and a T-Square ruler to outline the inner edge of the frame. I then glued some florals to from the Wallpaper Art stamp set. 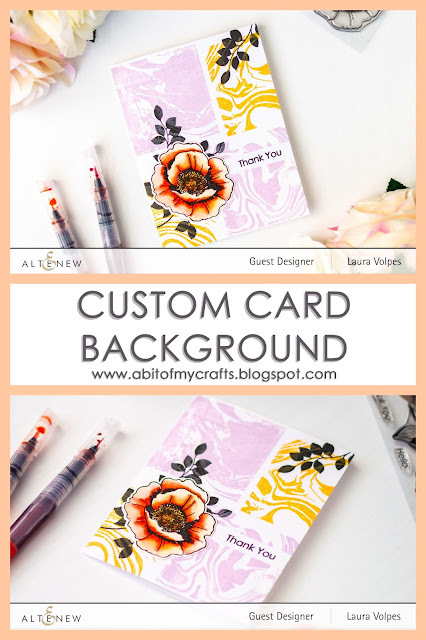 Also in this case, the florals were stamped on Canson XL watercolor cardstock, colored with the Tropical Fiesta Markers and die cut with the Wallpaper Art coordinating dies. I stamped the sentiment Thank You to the bottom right portion of my card front and that finished off my card. And now it's time to talk about the Celebrating Parents Card Drive and today's blog hop! Altenew is collecting handmade cards to be sent to seniors who are in nursing homes or shelters, in order to make them feel loved, celebrated, and honored. The cards will be collected through April 29th, make sure to visit the Altenew blog for all the details. 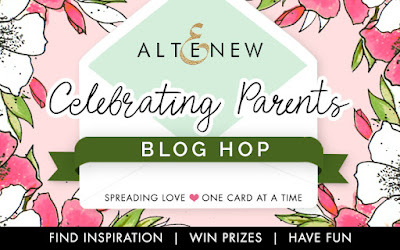 To celebrate the card drive, Altenew also put together a blog hop with lots of giveaways! 6 lucky winners will be drawn among the comments left on the Altenew Card Blog to win a $30 gift certificate. One winner will also be selected to to receive a $15 gift certificate from the comments left on each designer’s blog on the blog hop list below. All winners will be announced on the Altenew Card Blog on 4/17/2019. Good luck! 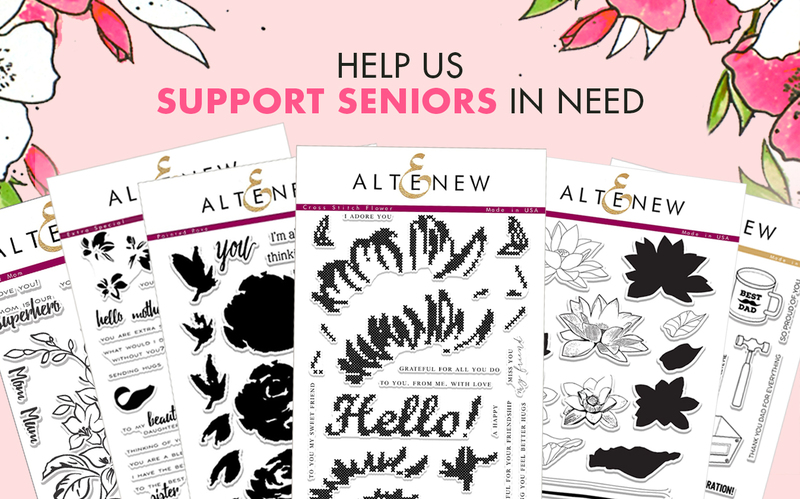 Last but not least, 20% of the profits earned from select stamp sets (Best Dad, Painted Rose, Extra Special, Lotus, Cross Stitch Flower, and Best Mom) by 6/16/2019 will be donated to the Food Bank of Central New York to support seniors in need. I truly believe that this is a great cause and I am honored to be helping spread word about it. Thank you all so much for stopping by and have a grat day! How you chose the colors for the specific one day at a time stamps, and making a quad background is amazing. It’s a perfect setting for the blooms, and will surely bring joy on a parent’s special day. Those marble stamps are so fun. You did a great job with these designs. Love them. Love the pattern blocking you did. Really cool. Gorgeous background. This card is so very, very pretty. Thank you for sharing your talent. Love your cards! The first one is my favorite. I love the creativity! Your card is Beautiful and love this stamp set Wallpaper Art. The flower is a nice size really works and your watercoloring is nice too. I’m blown away!! Gorgeous creation! Just love the bright colors on the cards. Thanks for sharing your talent. Fabulous cards - I love how you used the marble set to make those backgrounds. I just got that set myself and can't wait to give it a try - thanks for the inspiration! Such lovely cards. I love the deep, rich colors. And I really like this stamp set. Beautiful cards. Love the marble background on the first, and the green on the leaves of the second is amazing, it just pops of the page. Thank you for sharing your creations. Lovely cards! My favorite is the first one. Beautiful backgrounds! I love the sentiment... THANK YOU is just what parents deserve! Very beautiful cards. I just love the bright flower on the second card. Your oranges are wonderful! Lovely card designs Laura! Thanks for the inspiration! I like your cards because they are so different. The background is so neat and I like your choice of colors. Thank you for inspiring me. Gorgeous card. Love the orange floral image. You're going to make someone's day happy! Love the colors! Some special person will definitely be smiling when they receive these cards! These cards are so beautiful! Love the wallpaper art stamps/dies and you used them brilliantly. Oh the marble backgrounds - how beautiful! Pretty designs and colors. I like the marbled panels. Very nice cards. I love the stamp you used and the marble background is great. Gorgeous cards and the wallpaper art stamp set is just beautiful! Great choice to use it for your projects. Both the cards are gorgeous. I love the background on the first card. Gorgeous cards!! Love the marble background. Thank you for sharing. Really love your thank you card. Simple yet dynamic! Thanks for sharing your creativity! Creative and different looks. Thank you for sharing your talents. Love how you made a frame on the last card using the marble background. I also love the wallpaper blooms. They are gorgeous. I just love this stamp set! You have made lovely cards with it. That flower looks beautiful in both cards. Beautiful cards! Love the marble background squares and the blooms are gorgeous. Thankyou for sharing on Altenew's card drive. Having been a visiting nurse, I cannot tell you how many of our elderly are forgotten by family or without family all through the year. Having this card collection to bring them a bit of cheer is such a simple thing to do, and will bring them so much joy. Your cards are just gorgeous, and made ME happy, too!